Daimler CEO Dieter Zetsche stands with the F125! concept car. The F125! was built with an eye to what big luxury cars will be like in 2025, another exec said. FRANKFURT -- Here's a riddle for luxury automakers: How will big, high-powered cars fit into a world that's greener, more congested and more tightly regulated than today? Mercedes-Benz rolled out one possible answer here last month with the F125! concept car. The F125! checks off many of the boxes on automakers' future-think wish list: hydrogen fuel-cell powertrain, high-priced materials, computer-assisted driving, advanced telematics. So it's tempting to see it as a science project. 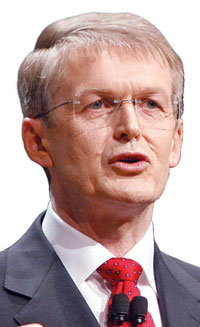 But if you listen to Thomas Weber, r&d chief for Mercedes' parent company Daimler AG, you realize that the F125! addresses a serious concern -- the future of Mercedes' S-class vehicle line. "This is a visionary outlook that's the direction we have to go with large cars," Weber said in an interview at the Frankfurt auto show. In a company statement, Weber said the F125! shows that "the legendary S class will continue into the future." Significantly, the F125! team peered further ahead than Daimler does with most concepts. Weber said that the company's "research cars" usually show what might happen one generation into the future. "This research car was built with the perspective of, what does a car in 2025 look like? -- more than two generations ahead," Weber said. -- By 2025, the corporate average fuel economy requirement in the United States is expected to be 54.5 mpg. -- And the European Union will have toughened its carbon dioxide emissions limit. The EU is set to impose a corporate average of 130 grams emitted per kilometer driven (7.4 ounces per mile) by 2015, and has set a goal -- not yet a law -- of 95 grams per kilometer (5.4 oz./mile) by 2020. By contrast, the overall average for vehicles in the EU was 154 g/km (8.7 oz./mile) in 2008, according to ACEA, the European automotive industry association. Those limits put pressure on makers of large internal-combustion-powered cars such as the S class. The S class encompasses a variety of vehicles, but, as an example, the 2012 S550's U.S. fuel economy ratings are 15 mpg city/25 highway/19 combined. According to a Daimler Web site, CO2 emissions for European S class vehicles range from 149 g/km (8.5 oz./mile)for the S250 CDI Blue Efficiency to more than 300 g/km (17 oz./mile) for AMG performance models. Daimler has concluded that electric drive must be part of its lineup. "If zero emission mobility will be necessary, and that's what we believe, it's clear we have to change to electric mobility," Weber said. But that poses a problem in satisfying S-class customers, he said. Mercedes believes that S-class owners expect cruising range and power comparable to that of a current diesel-powered car. "The most important key figure was 1,000, a range up to 1,000 kilometers [621 miles] completely emissions free," he said. "That's what we think will be necessary in 2025." Put those two requirements -- electric drive and long range -- together, and you get a fuel cell vehicle, in Weber's view. The F125! 's fuel cell stack drives four electric wheel motors. Daimler decided to make the F125! a hybrid to reproduce the driving characteristics of the current S class, particularly quick starting and acceleration, Weber says. Where a fuel cell vehicle needs about 10 seconds to start, he says, with the plug-in fuel cell hybrid, "you get exactly the same feeling you know from your car today." But to get that feeling, Daimler has built the F125! around unproven technology. The concept replaces the standard cylindrical hydrogen storage tank with a system still in the research stage -- using new Kevlar-like material to store hydrogen in the body cavities, increasing onboard hydrogen capacity and range. The F125! would use another unproven method, a lithium-sulfur battery, to increase energy density. Weber says that battery chemistry probably will debut this decade in smaller applications such as power tools. "These two technologies are advanced, next-generation technologies, but they are not in the heavens," he said. "It's clear what kinds of technologies we are looking for. We believe as a visionary forecast in 2020, 2025, these kinds of cars are possible." Tim Urquhart, senior automotive analyst for IHS Global Insight in London, says the F125! shows the industry's uncertainty about how big luxury cars fit into the future. "It's a real vision of the future," Urquhart said. "Sometimes when an OEM is talking about these things, you take it with a pinch of salt. In this car, I think they are trying to imagine what a vehicle of this type would be like in the long-term future." Continued interest in fuel cells reflects doubt that lithium ion batteries will ever be able to match the range of a petroleum powered car, he adds. "You're not going to get a lithium ion powered EV with internal combustion engine power and range," Urquhart said. "The chemistry is not going to allow it."